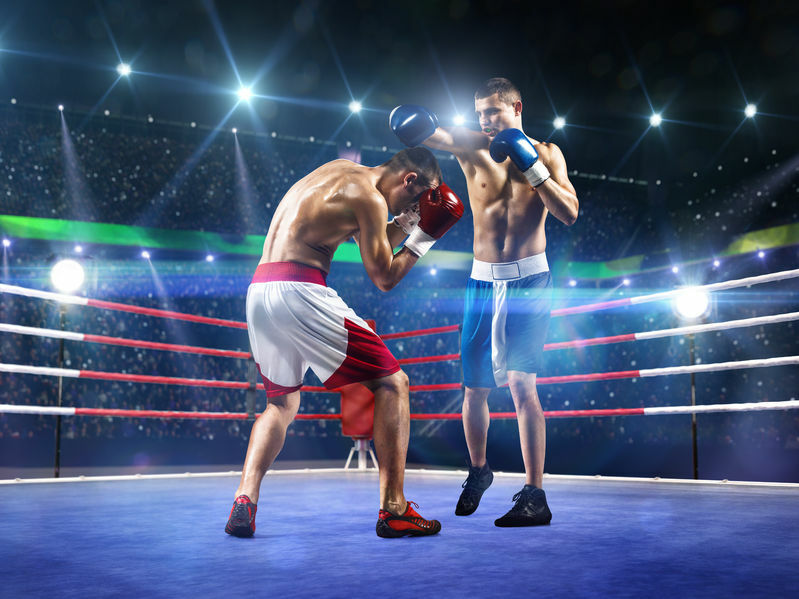 Boxing shoes are useful for sparring, boxing and fighting in a gym or for competition. You must wear boxing shoes for training in the gym, and you must hold onto your boxing shoes for the fights you take part in. Shoes you wear for boxing have flat soles that help you maneuver easily, and the shoes lace up to your ankles for added support. Your boxing shoe choices help you train safely in the gym, and the support you get from your shoes will help you train consistently without discomfort. Boxing shoes for men look much like basketball shoes that lace up to your ankle. These shoes are designed with a perfectly flat sole, and the laces tie above your ankle. A boxing shoe is created to prevent your ankle from rolling as you move around the ring, and the shoes slide gently on the canvas of the ring. Womens boxing shoes are designed in the same manner as men’s shoes, but shoes for ladies are shorter overall. The laces on a woman’s shoe do not tie as high, and the tight lacing will support your ankle properly. Ladies can train in the ring just like the men, but women must wear shoes that were designed for their feet. Your safety and comfort is at stake when you put on your boxing shoes. What Do The Best Boxing Shoes Feel Like? The best boxing shoes in the industry feel like flats that have extra support. You must feel the floor underneath your feet, and you should feel the support around your ankle when the shoes are laced up. Good boxing shoes are not too tight, but the shoes do not slip on your foot. Boxing shoes that do not fit you properly will cause sliding that could result in injury, and the ring gets slippery with sweat as you fight. Poorly fitted shoes could cause an injury that it hard to recover from. You will have more control over your balance and footwork with the shoes fit your feet firmly. Nike boxing shoes are the most comfortable shoes in the industry. The boxing shoes Nike produces have a softer outsole, more padding and better technology. You will wear Nike shoes knowing that you will feel the padding more than the floor, but the shoes will keep you comfortable for long periods of time. Nike continually makes advancements with their comfort technology, and you will see new shoes coming out from Nike that are filled with comfort technology. Other shoe brands do not provide the comfort technology that Nike uses, but every other company allows you to feel the floor more easily. Everlast is the most prominent name in boxing shoes, and their shoes have not changed in several decades. Anyone who knows a boxer has seen a pair of Everlast shoes, and Everlast created the traditional boxing shoe design. You will see the flat outsole, high laces and simple upper that are the hallmark of a good boxing shoe. Everlast shoes are priced well, and their shoes are designed to help you get in the ring as quickly as possible. Boxing shoes from Title are well known in the boxing world, and you may purchase a pair of shoes from Title for a good price. Keeping multiple pairs of boxing shoes in your bag is advisable, and you may keep a pair of Title shoes as an inexpensive alternative to your nicer shoes. Asics boxing shoes are designed with the fit of a running shoe, and each pair you wear will help you get the tight fit you are looking for. You need not worry about rolling your ankle in Asics shoes, but their comfort technology is not par with a company like Nike. You must try on your Asics shoes to feel the tight fit, and you may move on to Adidas shoes for a looser fit. Adidas shoes have the perfectly flat outsole that you need for boxing safely, and their shoes are designed with thick laces that help you create a snug fit. Adidas shoes are not as expensive as the competition, and you can carry your Adidas shoes in your bag with your other boxing shoes. You may try on each pair of shoes listed in this article to find the right fit, and you will discover which brand works best with your foot. Every boxer and fighter needs a pair of shoes that will provide safety and comfort in one package. Shoes that fit well prevent falls in the ring, and you must lace the shoes up to your ankles to avoid rolling your ankle. Purchase the boxing shoes that will help you fight in comfort, avoid injury and save money. You may purchase your shoes online for fair prices, and the shoes you choose can wait in your gym bag for the next fight to start.